There is a toy that just about does it all. Not only is it incredibly entertaining for one or one hundred (and everyone in between), it can also help develop gross and fine motor skills as well as stimulate creativity and help teach manners like taking turns. While playing with this item, your preschooler can learn about math and science. Depending on the size and what it is made of, it can be played inside or out and for the most part, one can be purchased relatively inexpensively and readily. This toy comes in different sizes, colors, and patterns so there is one to please everyone. What is it? The humble ball. 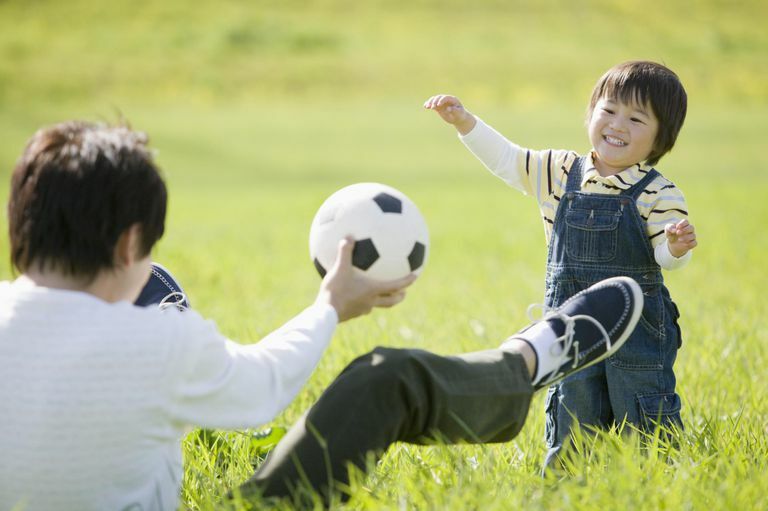 And while ball games usually conjure up sports such as basketball, baseball, and football, there is a host of other games and activities to play with a ball, particularly with a preschooler. Certainly, some of these can be brought outside too! Roll It: Any type of ball will work here, but if you have a younger child, consider using a ball made with soft material that size-wise will at the very least fit in her hands. Sit on the ground facing each other and position your legs open in front of you so they are touching, creating a corral for the ball. Roll the ball back and forth. Can she catch it? Can she roll it all the way to you? As your child gets older, introduce other challenges. Can she bounce the ball once to you? Clap her hands once before she catches it? The possibilities are endless! Keep it Up: A beach ball or even a balloon works best for this game where the object is to simply keep the ball in the air! If you do play this game indoors, make sure to clear the room of any breakables and to set clear boundaries of where you want the game to be played. Another variation is to deflate the beach ball slightly and then have your preschooler count how long it takes the ball to fall to the ground. What if you blow it up more — will it go faster or more slowly? Color It: If you've got a spare beach ball lying around or a ball that needs the touch of an artist, hand over some washable markers to your little one and have him decorate it. Note that the washable markers will come off your child, but not necessarily the ball so be sure you don't mind if the artwork is permanent. Bowling: You don't need an alley to play this knockdown game! Simply set up ten (or less) of an item — while empty soda bottles work best, you can also use blocks or even books. Position your preschooler a few feet away from the bottles and have them roll a ball at them. How many can he knock down? What happens if he rolls the ball faster? What happens if you change the position of your "pins?" Make sure you have plenty of space and that everyone understands the rules of the game before you start. Follow Directions: While a younger preschooler will likely have trouble with a formal game of kickball or whiffle ball, you can still play a fun ball game that is similar. Stand on the "pitcher's mound," about seven to ten feet away from your preschooler. Roll a playground-type ball towards your preschooler and then call out a direction — jump over it, kick it, roll it back, etc. Once your preschooler has done what you said, have him run to first base. Keep It Up (Foot Style): As mentioned above, try to keep the ball in the air as long as you can, but this time, only use your feet! Towel Toss: Grab two beach towels and practice throwing and catching a lightweight ball between yourselves using them. Your preschooler may have trouble with the game at first, but you will definitely have a lot of fun with it! Say It: Good for a larger group, but can work with just two. Position everyone in a circle (or in the case of a pair, across from one another). Take turns calling out a category, like colors, ice cream flavors, names, etc. Before you toss the ball to each other, the thrower must name something from the category. Keep Away or Monkey in the Middle: Good for three or more, the idea is to simply keep the ball away from one player by either throwing the ball to someone else or running with it. If you are playing with a younger preschooler, keep in mind that the frustration level can be high here. Make sure little children aren't stuck being "it" most of the time. Through the Hoop: If you've got hula hoops lying around, put them to use. Either lie them on the ground and see if your preschooler can bounce a ball into one (or two) or have one person hold the hoop up and have the other toss the ball through. How far away can your preschooler stand and still make a goal?